Knowledge is Power: Preparing for the Growing Importance of Google Knowledge Graph - Fuze, SEO, Inc. Author and tech journalist, Steven Levy, has released an in-depth study on the evolution of Google over the years, and the continued advancements that have allowed the search engine to compete in the changing landscape of search–in particular, the advent of mobile search’s growing influence over desktop search. A key finding of this report involves Google’s Knowledge Graph; the product that aggregates information from various publishers to produce a direct answer to search queries that appears before the SERPs. The Knowledge Graph does not appear for every query, but according to Levy’s report, Google has alluded that as much as 25% of all searches may yield a Knowledge Graph result. While we aren’t able to anticipate which queries Knowledge Graph shows up for, this 25% approximation is substantial enough to demonstrate a change in the way Google is thinking about how people search. The Knowledge Graph is appearing for enough people to show that Google is taking user intent seriously: it is evolving to become more intuitive–to draw connections between the way humans think and the way humans search, and to provide results that reflect that. In essence, Knowledge Graph is representative of the overall shift to semantic search that became most apparent after the Hummingbird update in 2013. With semantic, or conversational search, Google aims to provide results directly relevant to the concepts or ideas people naturally search as opposed to a string of keywords. These overarching concepts, or “entities”, are shaping the future of search, and are the foundation of the Knowledge Graph. …we’ve been working on an intelligent model—in geek-speak, a “graph”—that understands real-world entities and their relationships to one another: things, not strings. The Knowledge Graph enables you to search for things, people or places that Google knows about—landmarks, celebrities, cities, sports teams, buildings, geographical features, movies, celestial objects, works of art and more—and instantly get information that’s relevant to your query. This is a critical first step towards building the next generation of search, which taps into the collective intelligence of the web and understands the world a bit more like people do. to be able to submit content to Knowledge Graph sources such as Wikipedia, and thus have some level of control over third party information about your brand that might be pulled into a Knowledge Graph result. A search engine that focuses on the entities present on a webpage means that the quality of the information on your site matters most. A keyword strategy centered on keyword density and a fixed set of targeted keywords per page will no longer cut it. Your website’s content must be consistent, authoritative, and thematically relevant. Content must contain entities that are relevant to both your vertical and the kind of searches you’re hoping to get traffic for. 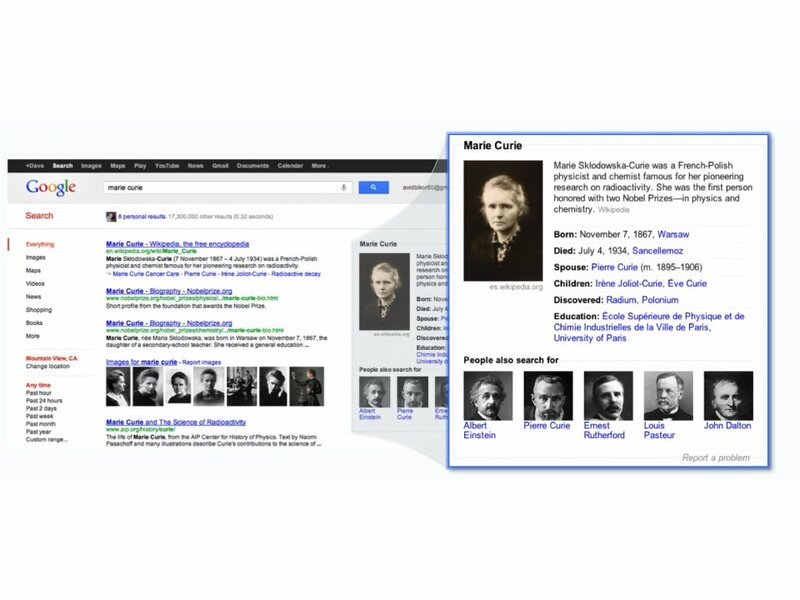 Knowledge Graph interprets entities in two different ways: implicitly and explicitly. Implicit entities are the elements in the actual text of your website. They are the topics of content on your site–the natural language you use to present information to the user. To an extent, they are also the keywords you’re going after; but you should treat those keywords as overarching guides for the creation of content. In order optimize for Knowledge Graph, identify the topics and information that matters to your audience and create content around that. Make sure the topic of each page is clear and that the content relates to that focus. Explicit entities are the structured data markup on each web page; the information Google crawls to determine what a page is about. This will allow the search engine to identify the entities on your page and determine the relationships between them. This is crucial to getting into Knowledge Graph, and the best way is to mark up your site using a structured data markup from Schema.org. Mark up each page, ensuring that the elements are properly identified, so that the information on your page is readily crawlable. It is essential that both your implicit and explicit entities are telling Google the same thing: your data markup must say that your page is about what your content discusses, and vice versa. Knowledge Graph won’t appear for a hundred percent of all searches–at least not for a while. There is a chance that none of your content is currently being pulled into a Knowledge Graph result, and that all of your organic search traffic is driven by SERPs. But 25% is a significant number, and in all likelihood, that number will continue to grow. It is representative of an overall change in the way search engines think, and the way we must adapt to keep up with that. Consider optimizing for Knowledge Graph–that is, essentially, optimizing for semantic search–as optimizing for the future. Tagged google, knowledge graph, mobile search, semantic search, structured data, structured data markup.